Organiser Rob Cross gives a low down on the history, organisation and, just when everyone thought it was nearly too late, a report on last years great event. Rob started the Grass Roots event at Sackville Lodge Airfield in 2008 having been heavily influenced by the long-standing Icicle Meet held every January near Hungerford, and all it stands for. Grass Roots is intended to be a summer version of this, held at a time which coincides with most of the fields being stubble. 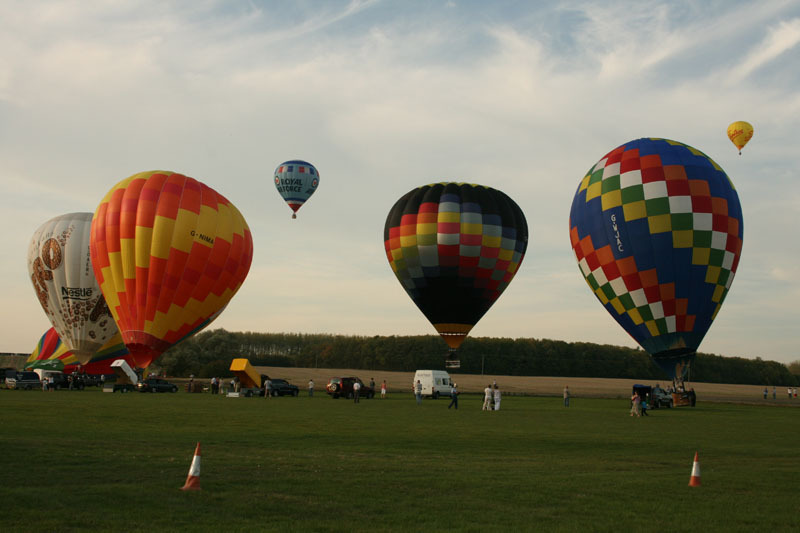 Prior to the Sackville Lodge events Chris Dunkley kindly helped me run a number of gatherings at Cardington and Old Warden, and Easy Balloons continue to support the Grass Roots cause by providing sponsorship and training – every year Chris has managed to do check out flights for PUTs. 'Team Sackville' starts planning the event as soon as the previous one has ended. Although the format of the event is the same each year, the reality of how each event pans out is always slightly different. 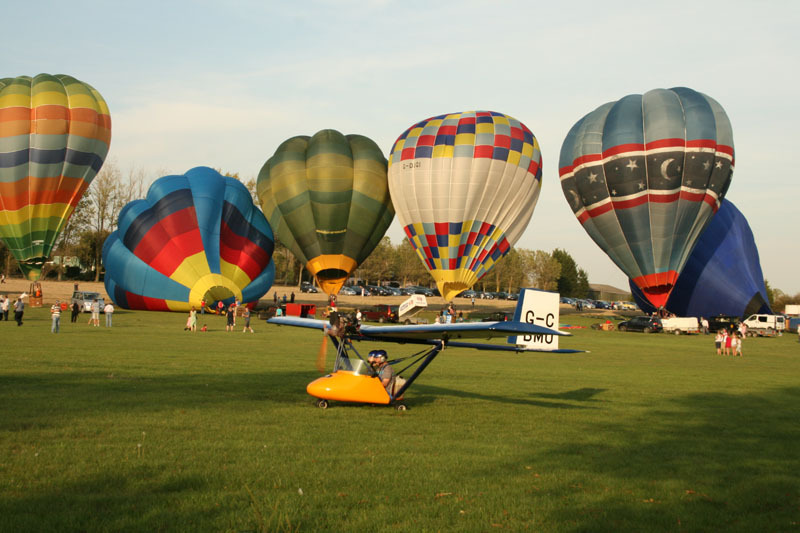 Grass Roots is partly about going back to basics, with lots of balloon teams gathering for a big flyout without all the pressures of large commercial meets. It has now become a well established event and we have found our home at Sackville Lodge airfield near Bedford. Tim Wilkinson and his family host the event and go to great lengths to ensure everyone is looked after and has a good time. 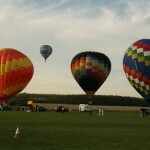 The event is held in late summer so that there are plenty of landing opportunities in the cut fields. Unlike most meets, part of our philosophy is that we will 'roll' the event so that if the weather is wholly unsuitable on the initial planned weekend we will roll it until we have a weekend where flying slots are available. This is possible through the flexibility that Tim has developed with local suppliers. He also allows everyone to camp on site so there is a very communal spirit and participants don't have to splash out on expensive accommodation. We invite local farmers to fly from the event in an effort to strengthen our relationship with the local farming community. Thanks to this age of email we provide all balloonists on our mailing list with 48 hours notice as to whether the event is on or not. Planning includes looking at the challenges we had at previous events and how we can make it better next time. There is lots to sort out including catering, gas, camping, airfield layout, toilets, showers, bar, liaising with CAA and neighbouring airfields, marquee from the NFU, grant from the BBAC, pilot emailing and registration, met forecast, risk assessments, liaising with emergency services and of course what happens if the weather makes all the plans go wrong. All of this is done with a small team of Tim, Peter Gray, Mark Stelling and myself. We are grateful to Barry Newman who acted as safety officer at the 2011 event. We once again approached the BBAC for a grant of £1000 to help us with the costs of running the event. This involves making a presentation to the Main Committee at the May meeting in Stratford. Other parties who are also making a grant request make their pitches. Each pitch is typically followed by an interrogation (questions) from the Committee which we all try to respond to appropriately, after which we are asked to leave the meeting whilst the Committee discusses the merits and deservedness of each plea. On re-entering the meeting I was told that our grant request would be met in full which was clearly a great outcome for us. Thanks to the BBAC for its continued support. The continued support of the NFU should not go unmentioned. They provide the use of a marquee free of charge. All they ask is for two day’s notice and they bring the marquee to Sackville and erect it. With regard to gas, last year's winter pushed up the basic price to 60p. After many phone calls from Tim, BP stepped in and would supply a tanker to fill on the Saturday of the meet, plus they would supply up to five checkouts with their gas to a maximum of 100 litres each. Tim purchased an extra 4000 litre tank and another 2000 litre tank with meters - gas sorted! The summer weather was not brilliant. Many events were badly hit by bad weather. As our first weekend of 9-11 September approached we started to get both restless and excited. 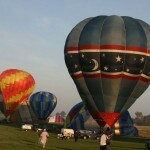 We were aware that nearly 90 balloon teams had expressed their intention to come to Sackville. As we monitored the weather we had a very easy call. On the other side of the Atlantic the hurricane season had been in full swing and the remnants of these hurricanes were hitting the UK thanks to the position of the jetstream. So with perfect timing the ex-hurricane Katia swept across the UK. The winds were not hurricane force but the forecast winds were strong enough to pretty much guarantee that no balloons would fly, so we easily decided to postpone the event. It’s always easy when it’s clear that the weather is going to be truly awful, but the most agonising decisions are when it looks marginal – do we, don’t we? 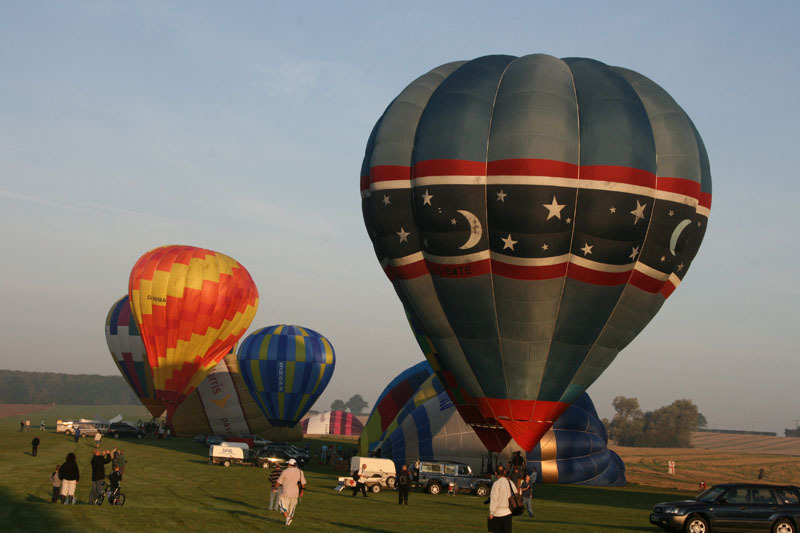 Many attendees have stated that they would come anyway regardless of the weather because they like the social element, but we really want the event to involve flying balloons. We then postponed the following weekend due to another forecast of poor conditions. The third weekend was not possible due to Tim having to work in Ireland. Eventually we opted for the first weekend in October as a huge blocking high was forecast over eastern Europe creating light winds over England. We also experienced a brief ‘Indian summer’ with temperatures hitting the high-twenties celcius. The only downside to postponing is that we lose some of the original attendees and there are fewer fields in which to land. However there were still over fifty balloon teams in attendance. On the Friday afternoon slot Rob Bayly kindly gave me a ride in his balloon. During the course of the weekend the wind speed and direction in the first three slots landed us in the same area and some very patient farmers kept good humour. It is fairly rare that the wind speed and direction remain constant at a balloon meet over three consecutive slots, but on the fourth slot we went on a more southerly track. Alex Daniels did her recommendation (Jon Dyer) GFT (Dave Court) solo (Jon). Ben Pettitt and Dave Court did their Group B Certificate of Test and Base / Line Check, with examiners Dave Court and Chris respectively. Gavin Chadwick and Andy Kaye did their Group B initial Type Rating with Chris and Dave respectively. Steve Cook – two flights, one with instructor Mike Gunston. Matthew Jemmett with Ian Warrington Caroline Jemmett with Rob Jemmett Gareth Bufton with John Sproat. Alex Court with John Russon. Robert Lovell with Barry Newman and Martin Lovell. Stephen O'Boyle with Sue Kidd and Ed Lubbock. Jonathan Walton instructor flight with Mike Gunston. Geoffrey Walton did exceptionally well by flying a farmer's wife and two children on the Friday afternoon, then another farmer and two children on Saturday morning, followed by yet another farmer and wife on the Saturday afternoon, this time landing on their farm! Throughout the weekend the social hub of the meet was the NFU marquee, with Tim, wife Angie and family continually cooking great food for everyone. The hogroast made its customary appearance. 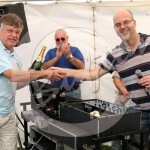 After flying on the Sunday morning we held the prize-giving. Adam and Alex were recognised for their checkouts. 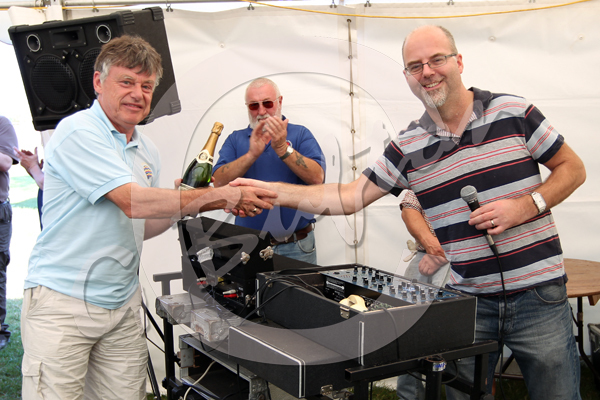 Chris Dunkley was also given a bottle of whiskey in recognition of his ongoing support and all the recent work he had done in the non-lifing legislation of balloon tanks, and all his great support for Grass Roots. Mike Gunston received a prize for running another tether school and Angie and the girls were recognised for all their hard work. We are very grateful to the many, in true grass roots spirit, who without being asked help us set up and clear away everything at the end. Many of these are the youngsters from the Chiltern Region. It is also good to see the regular attendees helping out the new teams. So what did all this work achieve? Fifty-plus balloons turned up to accomplish approximately 150 flights. Various checkouts were done and we had a successful tether school. There were no landowner issues of note, although we set up a temporary sensitive area on a farm that had previously been landed on by a microlight from Sackville. Most importantly of all, we very much hope that everyone had a great time. As the saying goes you only get out of it what you put in. Everyone puts a lot into Grass Roots, and we believe everyone gets a lot out of it. As far as Team Sackville is concerned seeing so many enjoying themselves is a great reward in itself. We thank everyone for coming – without you there would be no event. We also thank everyone that made it possible. We look forward to Grass Roots 2012 which is scheduled for 7-9 September – put it in your diaries!